Sakura can reproduce the delicate pluck of a single string, a violins bowing or the sonorous resonance of a grand piano. Most importantly, the curious musician can take control of every aspect of the simulation to create fantastic instruments. Ever wanted to know what a 20 foot guitar sounded like? Or a bowed piano? Now you can find out, Sakura opens up a world of string modelling possibilities, why not download the Sakura demo and try it for yourself. The Sakurazensen is coming, be there to experience it. Like the transient beauty of Sakura (Japanese for Cherry Blossom), the sound of stringed instruments blossoms and fades. Image-Line brings you 'Sakura', the string physical modelling instrument, to express the delicacy and beauty of stringed sounds. 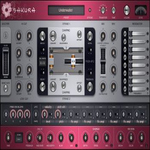 Vibration - Sakura's dual string model then gives the operator control over a wide range of parameters such as damping, tension, positioning and string properties. String interaction - The dual strings are then mixed, panned and enveloped to simulate interactions. Resonance - The string/s vibration then interacts with an 8-resonator 'body simulator' to create the size, material and shape of the instrument.